When shall we call it Higgs? In one week from now we'll have a new release of Higgs boson results from the LHC. Although in private it's always the Higgs, in official communications the particle discovered at the LHC last year is being called different names: sometimes the 125 GeV particle, sometimes a scalar boson (as opposed to scalar fermions), and most often a Higgs-like boson. This caution was understandable at the early stage, given the fresh memory of faster-than-light neutrinos. However, since it's been walking and quacking like a duck for more than half a year now, there's a discussion among experimenters when they will be allowed to drop the derogatory "-like" suffix. So, at which point a particle becomes to a Higgs? One issue discussed at length in this context is the spin. This is however moot as we already know with great certainty that the answer is 42 zero. We know it's a boson. We know it's not spin 1, because the young Landau theorem says an on-shell spin-1 particle cannot decay into massless vector bosons, and we do see a resonance in the diphoton channel. Formally it might be spin 2, but in practice it cannot be either. For spin 2, the new particle would couple to all matter via higher-dimensional non-renormalizable operator, and then simple estimates suggest that the ratio of branching fractions in different channels, e.g. in ZZ vs gamma-gamma, should be completely different than what is observed unless the couplings take highly unnatural values. Moreover, if Higgs were spin-2 the electroweak precision observables measured at LEP would be severely affected. Finally, spin-2 would be similar to a Higgsless theory in that the scattering amplitudes explode, and the theory would require new physics below 1 TeV (that we see absolutely no hint of) to make sense. Thus, the 125 GeV particle has to be a scalar, barring the biggest conspiracy since Roswell. If you don't buy that argument, bear in mind that you'll never be able to formally exclude the spin-2 possibility. Indeed, one can experimentally disfavor particular spin-2 benchmark models, but as there are numerous possible operators to couple spin 2 to matter there will probably always be a combination of the parameters that can fit the data. If you don't accept that argument either, note that Nima-Arkani Hamed said he would kill himself if it's spin 2, and most of us don't wish Nima dead. which are not couplings to mass terms. These are higher dimensional couplings than those in L1, so generically they should be less important. Nevertheless, some symmetry reasons or selection rules may forbid the couplings in L1, in which case the h scalar would be an impostor and not the Higgs boson. Any of the couplings in L1 or in L2 could mediate Higgs decays to W bosons and Z bosons (as observed at the LHC), or mediate Higgs production in association with W/Z and in the vector-boson-fusion process (also kind of observed). However, the difference between the couplings in L1 and L2 is that the latter play no role in electroweak symmetry breaking. In the technical jargon, they don't affect the amplitude of the longitudinal gauge boson scattering at high energies, therefore they are irrelevant for restoring unitarity of the theory with massive gauge bosons. So we the following definition. A Higgs boson is a scalar particle that couples to W and Z bosons as in L1, with cV > 0. Along the same vein, one can define the Higgs boson as a unique Higgs boson with the cV coupling close to one. Thus, to prove we are dealing with a Higgs and not an impostor it is enough to prove the coupling cV is non-zero. Actually, we already know that based on the current data. 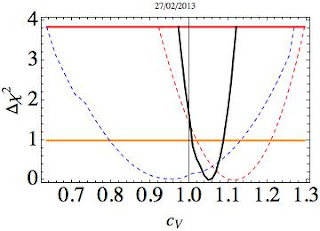 The shabby figure on the right shows the fit of the cV parameter to the LHC Higgs data (blue) and to LEP electroweak precision data (red), after marginalizing over the remaining parameters of the effective theory. Both of these data sets independently exclude cV=0 at a high confidence level, and even more so when they are combined (black). So, with very few assumptions, and independently on what the values of the other couplings are, one can argue the particle discovered at the LHC is a Higgs boson. At 95% confidence level cV is within 15% of the standard model value cV=1, so it clearly smells like the Higgs boson. But of course that last statement is less robust as there's still a lot of room for other Higgs bosons being present in nature.